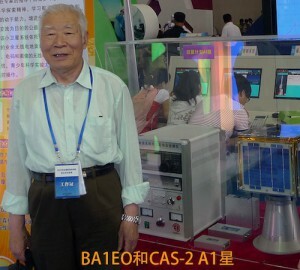 CAMSAT and students at the Qian Youth Space Academy have been working on the next satellite CAS-2 this is the successor of the first CAMSAT amateur radio satellite CAS-1 (aka XW-1, HO-68). The launch of CAS-2 is planned for 2014 into a 1000 km orbit with an inclination of 12 degrees. This orbit means it may not be receivable in those countries at high latitudes. It is understood that most of the room in CAS-2 will be taken up by the primary (non-amateur) payload and it has only been possible to fit a single channel FM amateur transponder in the satellite. The announcement of May 20 indicates that two separate CAS-2 satellite structures are being built – A1 and A2. CAS-2 will launch at the of end 2014 with a new Chinese missile from a new Chinese launch site into a sun-synchronous orbit to start. It is also developing another satellite to be 3-axis stabilized and is to be launched in the GTO. Date is still unknown, but here I would suspect the 12 inclination more. All following satellites are equipped with substantially the same Amateur Radio payloads, a U/V mode linear transponder, a CW telemetry beacon and an AX.25 19.2k/9.6k baud GMSK telemetry downlink. Each Amateur Radio complement has the same technical characteristics, but will operate on different 70 centimeter uplink and 2 meter downlink frequencies. CAS-2 launch information unknown at the moment.